Our analysis shows that China will enjoy strong growth in digital gamers and games revenue in the next 5 years, to reach $42 billion USD in domestic revenue by 2022. China has over 600 million gamers (more than 2x the population of the US). 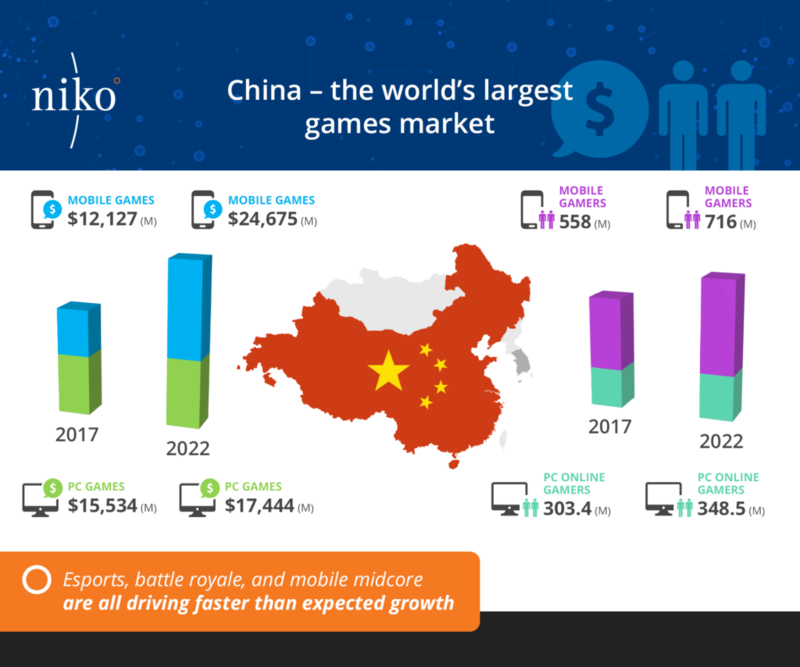 And nearly early half of them play on PCs, making China the single most important market in the world for PC online games. The report explains our analysis on where that growth will come from, which segments are hot now and growing, and what the impact on the holistic games industry will be. China’s PC online games revenue is projected to grow from $15.53 billion in 2017 to reach $17.44 billion in 2022. There were more than 300 million PC online gamers in 2017, with close to 350 million projected by 2022. Overall growth was offset by a decline in casual games revenue, driven by a shift of casual games and gaming hours to mobile. Core gaming categories are thriving, due to both a rebound in legacy titles and the introduction of new competitive genres such as battle royale. Esports continues to be one of the strongest drivers of growth.